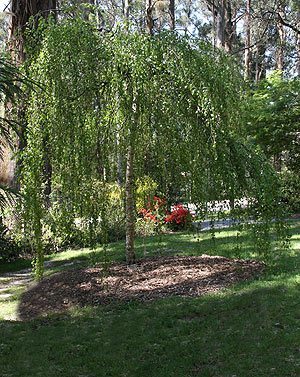 A widely grown ornamental tree, the Silver Birch is Betula pendula is a medium sized Silver Birch reaching a height of around 8 – 12m. In cool to temperate climates this is one of the most widely grown species in Australia. With a fairly upright growth habit it is the drooping nature of the tips of the branches that give it the name. The white trunks become more pronounced with age, in fact younger trees tend to have grey trunks. Used in the garden as a feature tree for its attractive white trunk and good green glossy foliage that puts on a subdued show of yellow in autumn. Also planted in avenues along driveways to create a cool shaded entrance. Excellent planted in groups in larger gardens. Height – Will reach 8 – 10 metres depending on variety, soil and climate. Spread – To around 6 metres across the crown on a mature specimen. Foliage – Mid to bright green with golden yellow autumn tones. Flowers – Long catkins in spring. Position – Full sun to afternoon shade in warmer areas. Pruning – Generally only remedial pruning of dead and damaged wood is required. Best pruned from spring to summer. This is a ‘cut leaf’ variety with almost feathery foliage, same pendulus foliage. Sometimes called the ‘Swedish Birch) it does lose the foliage early. This is the ‘Purple Leafed Birch’, trademark purple foliage. A clearer white trunk than other forms, and we think one of the most attractive. When young, the bark is a grey colour, however as it ages the beautiful white trunk makes this a standout feature tree. Best suited to the cool to temperate regions of Australia Betula pendula grows well in a humus rich deep soil. Good drainage is essential, however long dry periods during summer will require watering. Fertilize with a slow release fertilizer in early spring and again in early summer. Water well before fertilizing and again after. Generally available as seedling trees through to larger specimens at 3 – 5m.